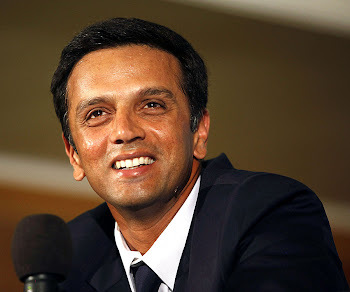 While searching through Google, I came across an article "Rahul Dravid: Cracks in The Wall?" at Rediff.com.The author had compared his past performances with recent ones, and straight away came to the conclusion that the Wall is cracking down.Even though Rahul had a forgettable 2008, I was amazed why people had started questioning his "wall"ish ability. Today, Rahul proved that he is still the old, firm and dependable "Wall".He played 220 delieveries, spent 4 hrs at crease, without giving any opportuinity to the kiwis.The situation demanded his stay at the crease and he was doing it perfectly, until a poor umpiring decision sent him back to the pavillion.Ofcourse he was dissapointed, shaking his head when the appeal went up and opened his mouth in shock when the finger went up. He walked off quickly but kept shaking his head and hit the ground with his bat after a few steps.He knew he had to leave his team in an uncomfortable position. That is something which really frustrates fans like me - our hero is playing so well, and suddenly a poor decision shatters our dreams(I was damn sure that Rahul would have played for full day, with a ton in his record).But, that's how cricket is - you have to accept such decisions like a gentleman! The Wall is still strong. I would expect the wall will get stronger in future also. It is unfortunate that he got out due to an umpiring error. But, still there is one more test match for him to win the series for India. BEST OF LUCK RAHUL 'THE WALL' DRAVID. I entirely agree. He is still the wall and will remain so till he plays Test Cricket for India. He is our MR. DEPENDABLE! wow! 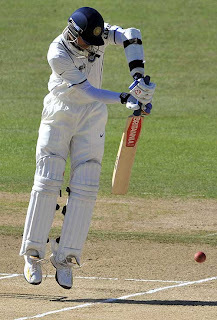 A complete blog on Rahul Dravid!